Arcos enjoys a mixed climate, partly Mediterranean and partly Atlantic, and receives over three thousand hours of sunshine a year which has helped make it one of Europe’s favorite holiday destinations. With its outstanding natural beauty, impressive location and significant and archaeological wealth, Arcos was declared a National Historical and Artistic Monument in 1962. Here stress evaporates. All you need to think about is how to enjoy yourself most while you are here. We were delighted to read that you enjoyed your stay and thank you for taking the time to write your kind review. We were delighted to read your comments about the villa and standard of the fittings. So pleased to learn that you were happy with the overall experience, and you found everything excellent. We thank you again for reviewing your stay and we do hope we can welcome you back on your next visit to Cádiz. A stunning property with beautiful views. The villa was in a perfect location for our family. It was really clean and very well equipped, having everything we needed and more. The stunning views were a joy to wake up to each morning and the pool was crystal clear and maintained once a week as part of the service. Nuria and her team were a delight and helped make our stay the amazing experience it was. Thank so much for placing your review on HomeAway we really do appreciate you taking the time to do so. We were delighted to see that you found everything excellent and we value your feedback. Thank you for being our guest. It would be a great pleasure if we could welcome you at Arcos Gardens again in the future for your next family getaway. 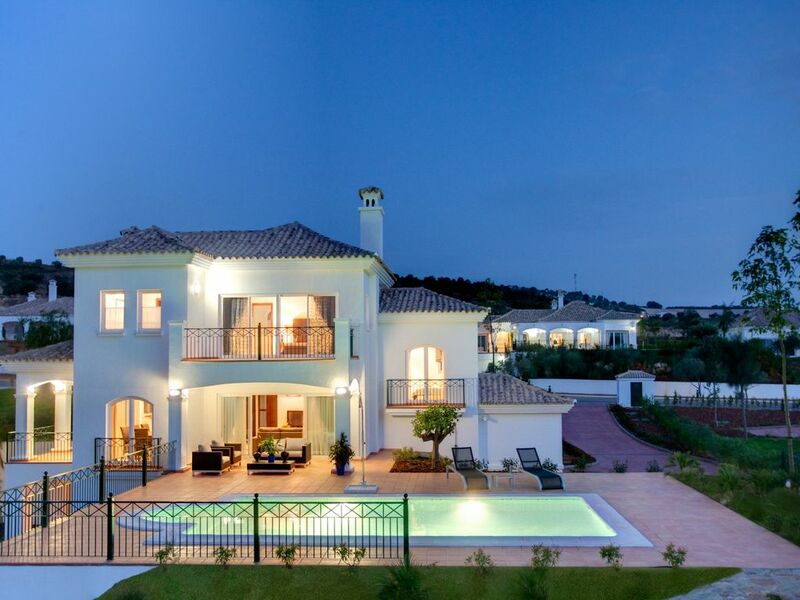 Fabulous villa, spotlessly clean & fresh. Great views & nice aspect for the sun ( & shade ). Some lovely restaurants in Arcos which is a beautiful little village. Golf course needs maintenance of course but its a good course & still very enjoyable. Only reason for 4 star & not 5, is that the on site restaurant in the hotel was very disappointing - pretty little courtyard but poor food. We were delighted to read that you enjoyed your stay at Arcos Gardens and thank you for taking the time to place your amazing review. It was a pleasure to welcome you and your family to the resort for your holiday gateway. I thank you for bringing the matter of poor food at the Cortijo restaurant, your comments provide me with invaluable feedback, and will be taken into account when discussing such issues with the food & beverage manager to ensure an improvement in the quality of food, since our intention is always to provide good value for money with all the services and facilities the resort offer. We really do appreciate you spreading the word and look forward to welcoming you back for your next stay. We were delighted to read that you enjoyed your stay and thank you for taking the time to place you amazing review.Thank you so much for your very kind comments - especially about our team and standard of the fittings. It was a pleasure to welcome you and your family and we look forward to welcoming you back for your next stay. House is clean and modern, airco works perfectly, view is really nice, and the pool is superb during the hot days (around 40 degrees). Kitchen has all utensils you need, great fridge. Living room is smallish but no issue, nice TV and good WiFi. Rooms are spacious, bathrooms are really good. And Arcos (the town) is beautiful, with excellent restaurants and a great supermarket (Mercadona). But all of it is topped and supplemented by the great welcome you get from Nuria and her team. We arrived late but she stocked the fridge for us. The tennis courts were enticing but we couldn't rent rackets: 2 days later she brought us a set that she went out and bought for us to use! A broken lawn chair was replaced the next morning! The house and the surroundings are great, but Nuria made it a wonderful, truly perfect holiday !! We are definitely coming back !!! Dear Guest, thank you so much for taking the time to place you amazing review. We are delighted to read your kind comments and thank you so much for highlighting the quality of the property and service. Thank you also for mentioning the team - they are great ambassadors for the resort and your comments bore out there commitment to ensure our guests enjoy there stay at Arcos Gardens. We are delighted to receive such positive feedback. Hope we can welcome you back soon! FUIMOS TODA LA FAMILA Y AMIGOS Y TODO HA ESTADO MUY BIEN. LIMPIO, LAS CHICAS SUPER ATENTAS Y ES TOTALMENTE RECOMENDABLE. Where you can enjoy the famous tour of the beautiful White Hill Towns, but also allows you to walk along the golden sand beaches and pure blue sea of Cadiz coast. Finally, experience a never ending list of events including flamenco, fiestas, horse shows, Carnivals, Jerez Horse Fair, Easter Week, Toro del Aleluya, Crosses of May, Feria San Miguel and Living Nativity in Arcos, or motor sport at the F1 Jerez circuit.